We think this may be some kind of record... We could of course have done it in under a fortnight if we had a different agenda, but that would have been to miss the point of what we are doing. Anyway, on Saturday we left the anchorage off Puerto Sherry just after 0700 as we were up early, not having slept much due to the westerly swell coming into the anchorage making us roll all night. We had quite a fresh wind and lumpy sea on the beam and later on the starboard quarter. 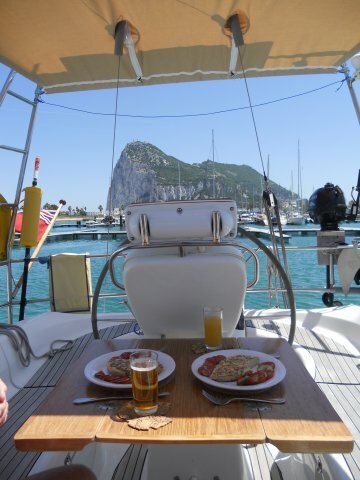 We toasted Nelson and the British Fleet with, alas, nothing stronger than a mug of soup as we passed Cape Trafalgar. As we approached Barbate, the wind continued to freshen until we had 25 knots by the time we berthed on the reception pontoon. Barbate is reportedly quite a desolate place, so it was as well we had a good forecast for the next day to make it just a single overnight stop. There was also some sort of fairground set up with music blaring away, although we were so tired, neither of us heard the racket through the night until we woke up at 0600 when it was still going! 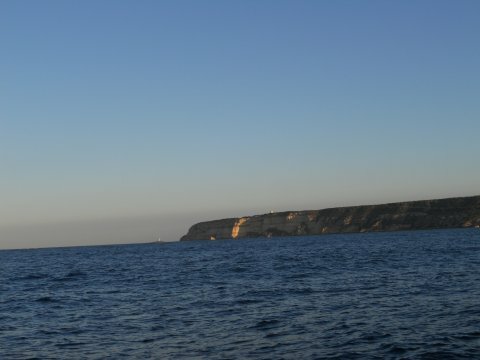 We left Barbate at first light and leaving Cape Trafalgar behind we had less than 8 knots from astern, so motor-sailed with just the mainsail set for about the first 3 hours, but made good speed as we gradually picked up some favourable current. As we tried to identify the next headland we'd be rounding, we suddenly realised that one of the 'lumps' of land we were looking at was actually AFRICA! Our first new continent, and it wasn't even Ann's birthday, although she does have a special one coming up in a few weeks time... We found ourselves a little emotional as we looked across to Tangier, suddenly Plymouth and the UK seemed a long way away, and we reflected on our journey so far. Although countless thousands of other people have done the same thing, we haven't read anything like this on any other sailing blogs, but it was a special moment for us. It must be even more so for people who cross whole oceans. Cape Trafalgar astern in the early morning light. Running through the Strait of Gibraltar - that's Africa over there! 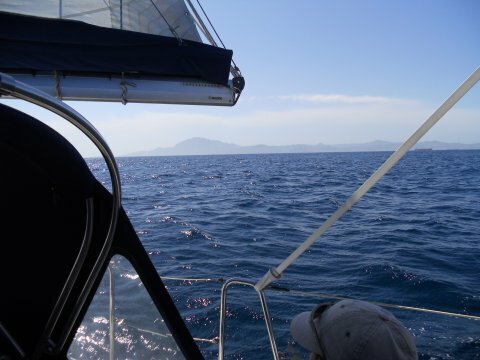 We motor-sailed for about 3 hours but, true to form, as we approached Tarifa, the wind increased and we had a great sail with the wind behind us until we approached Algeciras Bay, when in 30 knots of wind and the sea slewing us around things started getting a little more exciting than we prefer. 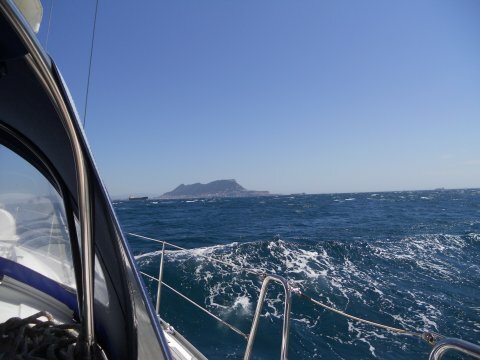 We also had up to 3 knots of current with us, so we were racing along at over 8 knots as we approached a multitude of shipping entering & leaving the bay, so we decided that motoring in to La Linea was a better option. As we were dropping sail Ann lost her hat, so that's one titfer and one slipper lost to the wind since we left Plymouth - not bad really! 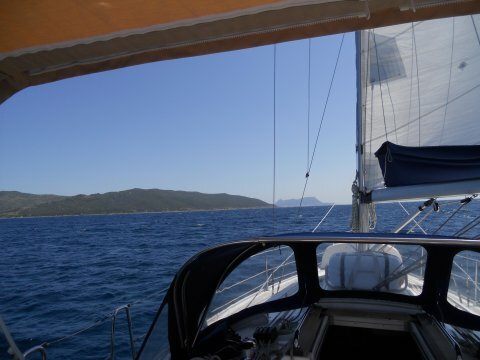 Enjoying a lovely run down towards Gibraltar before the wind increased to 30 knots. 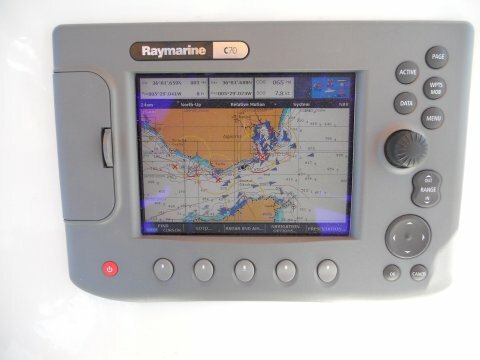 'twixt Europe and Africa - multiple AIS targets, and a bit later in the bay the screen turned purple! Parking place with a view. We have visited 'Blighty' across the border and will be back and forth to visit 'The Rock' and other important sites such as Marks & Spencer and Morrisons. We'll be here for a week or so to take in some sights, do shopping and washing and wait for the easterly winds to pass.